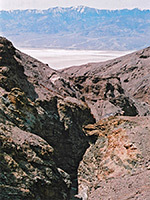 Of the many easily explored side canyons in the cliffs on the east side of Death Valley, one of the few with an official trailhead is Natural Bridge Canyon, reached by a spur road off CA 178, 4 miles south of the start of the Artist's Drive scenic loop. 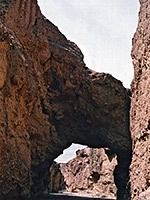 A short walk up the stony streambed leads to a large natural bridge, one of several such features in the national park - several more are found after a rather longer (3 mile) walk up Little Bridge Canyon, the next major drainage south of Grotto Canyon near Stovepipe Wells. From the parking area, it takes about ten to 15 minutes walking up a gentle but constant gradient, along the pebble floor to the natural bridge, which extends across the whole canyon and is quite impressive though not as graceful as the smooth sandstone arches of Utah. The bridge is made of conglomerate and looks somewhat unstable from beneath, split by deep cracks running through the span. After the bridge the ravine bends a few times and enters a layer of red rock where the canyon narrows, climbs over two small dryfalls and at one point is partially blocked by a large boulder, but with room to pass underneath. Next is a much bigger fall about 20 feet high, not easily scaled though this can be avoided by scrambling up the weathered cliffs on the left side. Above, the canyon seems to gain elevation more quickly, becomes shallower and branches several times - it doesn't seem worth continuing beyond here. 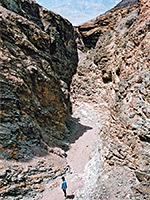 Other points of interest in the main canyon are several smooth vertical chutes in the walls, formed by flood waters flowing from hanging side canyons.